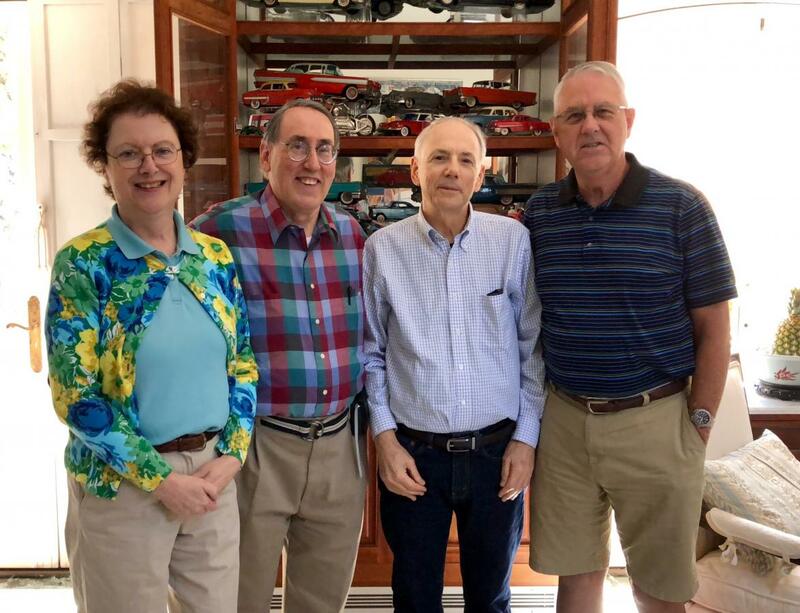 The Southern California branch of the DTCA is meeting! 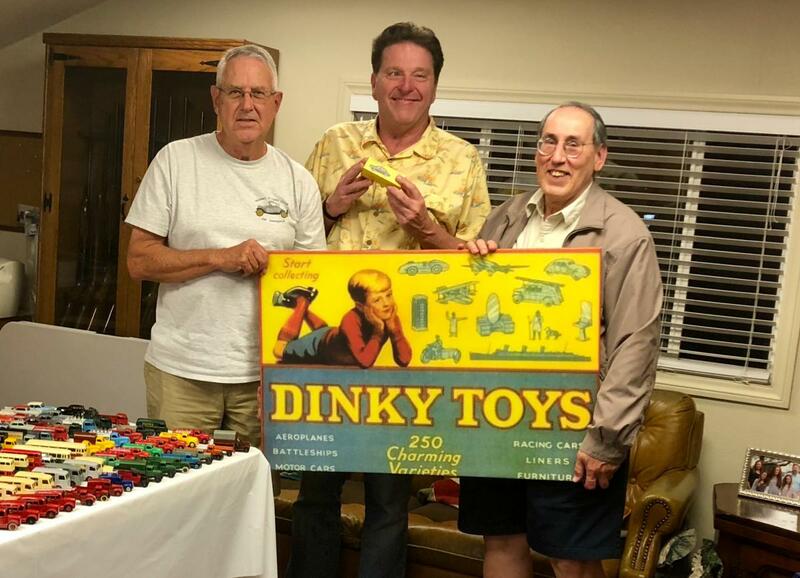 Just wanted to let the rest of you know that fellow DInky Toys collectors Jose Heraud and Jonathan Angel, will be traveling to our area and meeting at our house on Saturday, April 28. We will spend the day discussing our love of Dinky Toys and our collecting interests, and I will have my modest collection out of its cabinet, and on open display on tables. You may ask why this is worth mentioning....well, here we have no more toy stores, boot sales, or even toy fairs, so the opportunity to get together with esteemed fellow collectors is rare indeed. We will surely take some photos and I post after our momentous visit. After our day long meeting, I am treating the group to an outdoor grilled dinner, with fine Napa Valley red wine, and, of course, more Dinky talk. Re : The Southern California branch of the DTCA is meeting! I'm now counting the days! To add to what Terry said, yes, it is unfortunately rare to encounter a fellow Dinky collector in the States, especially here on the West Coast. The distances make it difficult (impossible?) for any shops selling antique toys to thrive, and it has been more than 20 years since eBay killed off swapmeets. Thanks to Terry's hospitality, this will be practically a "once in a lifetime" event! Wishing you all a great meeting. Pity it isn't after 3 May as Lina and I arrive in Los Angeles on that date and then we change to United that will take us to New York, well actually, Newark. Back to Los Angeles on 21st and then to Australia the following evening. Kind regards to you all and I can well imagine that you will have an absolutely "fair dinkum" "dinkyholic" gathering! Bruce——That is a shame.....that would have been incredible if you could have been in the mix with us! Will you be in LA long, or just passing through briefly? I want you and any other DTCA members to know, you always have a standing invitation to visit us when passing through LA. we are about 45-60 minutes south of the airport, near Huntington Beach area. Would you have some amount of time when you return on May 21? We will certainly have a grand time this Saturday, and it will be interesting, as we three have similar, but also different Dinky backgrounds, with Jonathan being a younger and later collector. 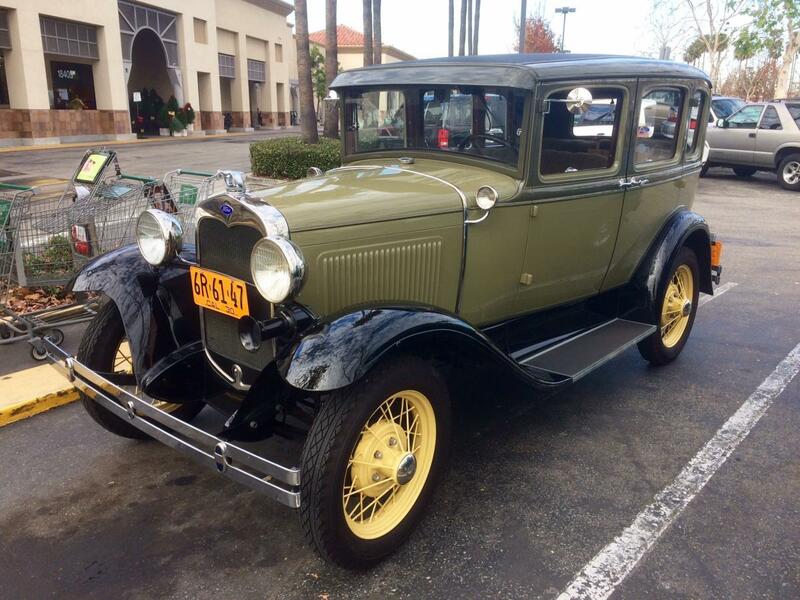 We are also going to see several wonderful automobile collections this next week, plus I will take Jose and his wife, Nancy, for a spin in my 1930 Model A Ford Town Sedan. Bruce, thanks for your kind wishes. I think Jose arrives in Southern California today, and as for myself, I am poised in a motel on the edge of the great wen, having persuaded my little Ford van up Tejon Pass. Terry has moved his collection from display cases out onto trestle tables for us to examine. Little does he know that whilst I may not have pushed Dinky Toys around on a carpet accompanied by appropriate engine noises for a few decades now, I have not forgotten how! Terry - so you live in the Huntington Beach area. I know that location very, very well. In 1981 Lina and I stayed with dear friends, Adolph and Helen Leirer who lived at 16132A Malaga Lane. Adolph was a pilot in the 22nd Bomb Group that served in the SWPA during WW2. We were again guests of Adolph and Helen several years later. We also stayed with friends who lived in Seal Beach, not all that far from HB, Patti and Tom Hall. On our way home, we are booked in a motel in the LAX area on 21 May, checking out the following day to catch our flight back to Brisbane that departs that night. I will send an email to you with the complete details. Jonathan - good to know that you have not lost the art of providing the appropriate sound effects when handling those precious items. Incidentally, I usually depend on emails with details of the latest Posts, but the last one I have received was on 18 April concerning Factory Errors. Do either of you receive messages from the webmaster on each new Post on the website with the exception of your own and if so, do you still receive any emails? My brain is in a bit of tizzy as we are trying to decide on what to see in New York. We already have tickets out to the Statue of Liberty but missed out on going up the statue. We were last in NY in 1981. I know these images have absolutely nothing to do with Dinky Toys, but thought I would throw them in anyhow! Here we are beside a 1929 Ford Trimotor at Browns Field, San Diego, 22 August 1981. I had just returned from my first and only flight in the Tin Lizzie as it was affectionately called. I am not sure who the fellow is, as he certainly had more hair in those days, but check out those bronzed legs!! Complete with socks at half-mast! Then two days later, Adolph took us to where Howard Hughes' "Spruce Goose" was "hiding", complete with netting to cover it from prying eyes from overhead aircraft. The aircraft is now in its own circular display building. Sorry about those time-capsule pictures! That is amazing that you stayed with friends, in the past, so close to where we live! We have been here since 1976, in the same house. And yes, I do get e-mail notices on posts, but sometimes I do not actually see them right away, and, if real busy, may forget to respond as well......a kind of senior moment. Possibly I can drive up and visit with you a bit when you are passing through on May 21.....please keep informed! I am sorry that I did not arrive in time to meet Philippe de Lespinay too, as he is one of the legendary collectors I first heard of decades ago. 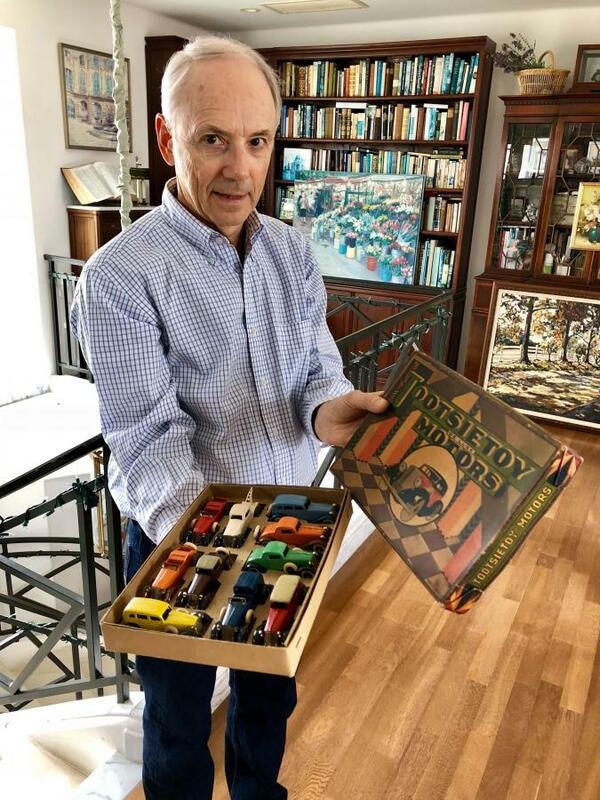 He has also lived a life so many of us would envy -- designed toys most of his life, worked for Heller, Revell, Matchbox, etc. etc. Off to Terry's in several hours. The weather is everything we hoped for -- the sun and air are amazing here!! Jonathan is quite correct.....here is that photo of the three of us, basking in the afterglow of a nice dinner, complimented with lots of Dinky Toys discussion between Jose, Jonathan, and myself. It has been a long standing dream of mine to host such a meeting with fellow collectors. We discussed many facets of our collecting, as well as pointing out some of our favorites. All in all, a great time was had by all! Jan—-Thanks, yes we did have a very nice time meeting each other for the first time, and also with considerable Dinky discussion. Jonathan is a bit younger than Jose and I, so his collecting era is a little later than ours, which makes it interesting. He also now has several vintage Dinky Toys display cases, which I am hoping he will share here.....they are simply wonderful! I have not yet put my models back where they belong, but that is looming very soon. I need to thoroughly clean and dust all the glass shelves and doors first.